The slice looks like it would fit right into the cake. The perspective seems to throw it a bit off though. Also, starting next month-ish, expect LOTS OF UPDATES on the game's progress. As I will be working more or less full time on it for the next update. I'm working on the Gamepad Compatible text entry system today! I have written a bit of code and now have a functional onscreen keyboard that can be manipulated by gamepads and keyboards! This is just the first step into the features coming this month. A lot of new stuff is going to be leaked into the Alpha/Beta group before any full updates come out publicly. I just want to make sure it works right before a mass of people use it. Dev train, full steam ahead! After a while of jiggery pokery, viola! I love the colors (definitely a preference for brown, it makes everything warm) and the font (readable, round). My personal preference would be to make the gradient lines horizontal and to not have corners but just fill up the space. The background used for the keyboard actually used to be quite plain, I found most people liked it more the way it is. But, that doesn't mean I'm not open to changing it! This is actually old art, me and my artist are still working on the newer art. Just not enough of it done to warrant putting it in the game yet. The update I am currently working on changes much of the game, look and function wise. I am actually working on a bit of GUI stuff today, perhaps I'll be able to share screens soon! I'm really liking the font here too. For some reason, I'm unsure about the gradient on the side as you end up mixing gradient non-pixel art with the pixal font. Maybe a frame related to the theme of your game would be a possible good idea? Something old fashinoned like an old picture frame? Cool stuff anyway, really like the theme and vibe here. Keep at it. I've been wanting to make the GUI stuff have a wooden theme, I'll mess around with it later today. I'm currently working on adding dialogue, I've gotten the bare bones of the system in. It can take dialogue from a database of phrases, and draw them to the screen properly. It can also take small commands and feed them to the NPCs to make them do things. This will make development easier going a head, as I can just put commands in the database instead of hardcoding the NPCs to do things. The NPCs all have the same sprite right now, just until I can add the real art. This NPC is named Halsey, she's got a indifferent attitude toward just about everything. She is also the new Tutorial. She'll walk you around and show you how to do things. I'm using the new dialogue system to feed her commands to walk around and what not. 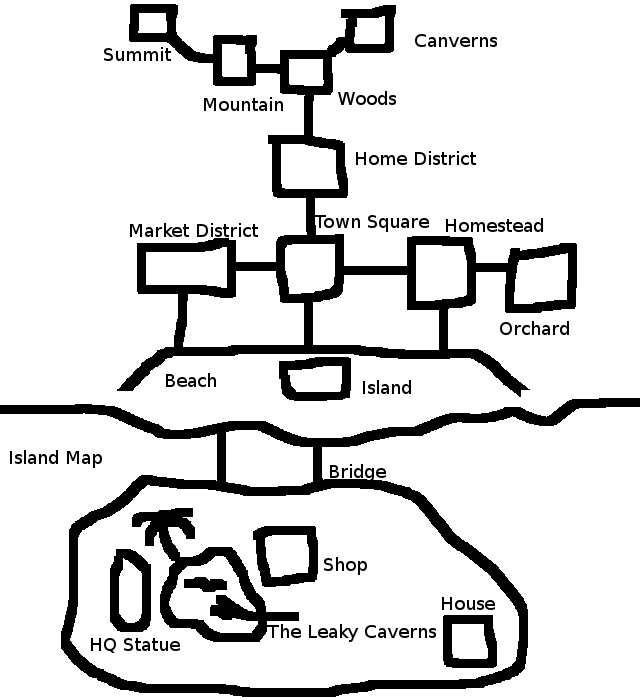 Been working on the system for a few hours now, but hopefully by day's end I'll have a new tutorial in the game. Also, thanks for the feedback Zizka! Me and my artist have been working on the list of NPCs for the game, trying to balance them all out against each other. Along with the release of "First Snowflake", I also updated the Homestead site. It looks much nicer now, and has been migrated to a new host by a friend. Development has been slow lately, as such there won't be an update before Christmas. I thought I could get the next update out before year end, but it's more work than I realised. Alpha/Beta testers can expect some updates around new year's with some test features and the like. Sorry about the delays, have a happy holiday! Welllll, I've done a small bit of work on the game, still no updates to release though. I've done some work on how the farmland is rendered. It seemed to be slowing the game down a lot in more recent updates. It now has no visible effect on FPS. Also, the FPS has been bumped to 60. This has no effect on the game visibly, but it does things much faster, which boosts performance. 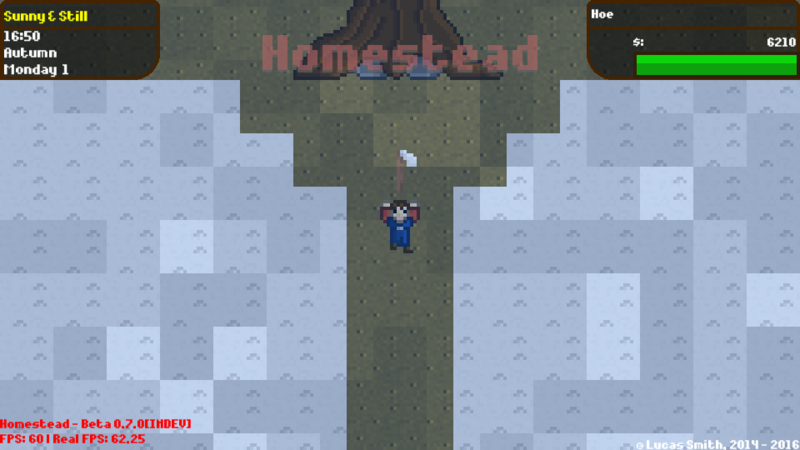 The weather systems have been updated too, they now use particles instead of instances, runs fast and looks nicer! I plan to add an NPC or two before releasing to the Alpha/Beta testers. The Demo will be updated shortly after that. New pause menu. The game will now default to this when the window loses focus. The inventory and stats menus are now accessed through the hot key assigned in Key Mapping, or the back/select/view button on a gamepad. The new pause menu still has a few quirks, and options access hasn't been implemented yet, but it's all on the way. Okay, update ahoy! The Alpha is now open to all! Happy homesteading, friends! Have a happy new year! The Alpha is now available to everybody! I meant to do this for a while, but the whole version system got borked a while back. Itch.io will be updated later today. Fixed the Chest, and did a bit of tutorial fixing. Next update will bring a bit more content. Hello Homesteadians of the TIG Forums! The game will now be updated a minimum of twice a month now! Updates will be on or around the 1st and 15th of the month, including this month. Keep an eye out for some new features soon, but be warned that these updates bring placeholder programmer art with them. Me and Ninety are working hard on getting the game's newer art done, but due to the art being at a higher resolution, the update to bring it all in will take time. Until then, please enjoy farming at a 16X16 pace. And, right after this post was a made, Ninety made a slew of new art for items and tools! We've actually got all of the tool art in the game now, which means I can start working on the tool tier stuff! - Changed the way farmland looks a bit. It's not new art, I edited s few pixels just to make it look softer until we reskin the game. - I changed the way the Stats/Relationships/Inventory/Chest screens look. 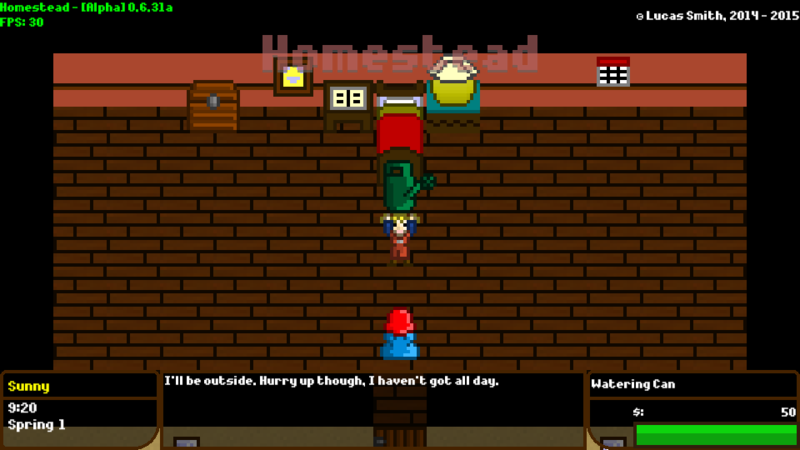 - The menu is now closer to what I want it to be, it scrolls over the town instead of empty grasslands now. -Updated the Phone sprite a bit too; still not official new art, I was just unhappy with it. -Mailbox was inaccessible due to hitbox changes. -Fixed some crops not being fully integrated into the, preventing planting and selling. So that has been integrated to be constant in winter. I made some menu changes to make the town scroll in the background instead of blank grassland. and edited a few sprites to make them look nicer until the reskin is done. I entered the GameMaker: Community Jam, so development is on hold from now until Monday. The GMCJAM was intense, and I was sleep deprived over the weekend, or I would have pushed a build sooner. So, you may look at the build numbers on this build and wonder "what the heck? 1.18.16? huh?" Since I'm using a bi weekly update schedule, the build number versions had to change. They now reflect the date the build was built. This makes it easier for me to keep track of them in the future. The build I just released doesn't reflect this in-game yet, but the next one will. Also, the Linux build has been held up, as I have bug hunting to do... I couldn't get it to build. Also, I'm unsure of all of the changes that went into this version. I'm still pretty sleepy from the GMJJAM weekend. Rather large bug found in the last release. I ask the you use the older version from the download page. There is a bug where you cannot harvest crops. This makes the game pretty difficult to play, since it's a farming game and all. I don't quite have time to work on it right now, I'm about to leave the house, but I'll get on fixing it as soon as I'm back. This applies to both Windows and Linux, as far as I'm aware. Work is slow, and fixing that bug has led to a few other issues. Trying to fix them, but they're tricksy little hobbitses. I'm also in the process of switching some stuff around internally to make the game's filesize a bit smaller, and make my life easier. The next update, on or around Monday, will not be able to load saves from older versions. This was a necessary step for the new item systems. I don't expect the save system to change too much going forward, but I'm not making any promises. I look forward to finishing and getting this update out to you guys/gals!